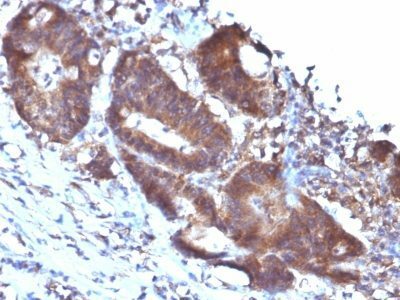 This MAb recognizes a 22 kDa protein, identified as Transgelin, also designated SM22-alpha. Recombinant full-length human transgelin (TAGLN) protein. U-2 OS, Hs68 or WI 38 cells. Colon carcinoma. This MAb recognizes a 22 kDa protein, identified as Transgelin, also designated SM22-alpha. It may cross-react with SM22-beta. Transgelin is expressed abundantly in smooth muscle cells. The human transgelin gene encodes a 201 amino acid protein that contains nuclear factor-binding motifs known to regulate transcription in smooth muscle. During embryogenesis, transgelin is expressed in smooth, cardiac and skeletal muscle, but is restricted during late fetal development and adulthood to all vascular and visceral smooth muscle cells and low levels of expression in heart. Transgelin is downregulated in several transformed cell lines, indicating that a reduction of transgelin expression may be an early indicator of the onset of transformation. Transgelin also binds Actin, causing Actin fibers to gel within minutes of binding. Binding of transgelin to Actin occurs at a ratio of 1:6 Actin monomers. Catalog number key for antibody number 0247, Anti-SM22-Alpha (TAGLN/247) The prefix indicates conjugation, followed by the antibody number and size suffix.